QQ: What kind of insurance do you carry? Q: What kind of experience do your employees have? A: We actually don't have employees at this time. We are a small, family run business. As for our experience, Melissa (that's me) is a former dog trainer who also has worked in a pet store and a veterinarians office. Billy has also spent numerous years working in the pet industry. We both have a great love for animals and have handled and owned many different kinds. Q: What happens at our first meeting? A: We come to meet you and your pets. We will be bringing some paperwork to go over and fill out and will need you to supply proof of a rabies vaccine at this time. Q: Do you have a referral program? A: Yes we do! 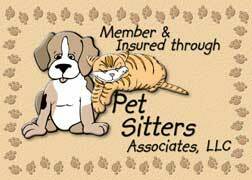 For every referral you send our way, you will receive $15 off your next pet sit. Q: Do you ever keep pets overnight at your own home? A: Unfortunately, we don't offer that service at this time. If you have a pet that can't be left at home alone for an extended amount of time, our service may not be the best solution for you. Copyright 2011 Paws and Claws Pet Sitting. All rights reserved.